Our group of fabulous jewelry-making artists met at Axios Estiatorio in Denver on a rainy October Sunday to exchange charms and enjoy some really fantastic Greek food. Annie started us off by showing the eye and heart charms she made for Sylvie’s “Eye Adore You” necklace. Using mixed media that includes beaded embroidery, felt, hand-stitching, and some very unique statement beads, Annie’s charms are truly eye-catching (excuse the pun). Sylvie’s charms for my Coral Reef bracelet included a mermaid and a jellyfish. A tiny model mermaid rests inside one of Sylvie’s signature “deviled eggs” – miniature dioramas that are truly delightful! The jellyfish was made with long plumes of yarn in a variety of colors and textures that really capture the look of tentacles. 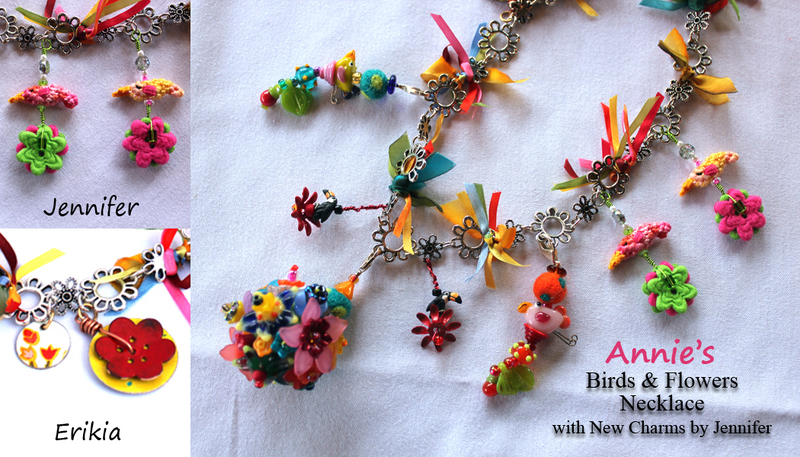 For Annie’s Birds & Flowers necklace, I crocheted two small birds based on a pattern I found at Attic 24. Using DMC floss and a size 10 steel hook, I crocheted three rounds, then added a tail before fastening off. After folding the bird in half with the tail at the back, I sewed up the bottom. Then I added a crocheted beak and stitched on the eyes and wings. The large flowers at the bottom are made from felt buttons (the same ones I use in Podge’s hair). 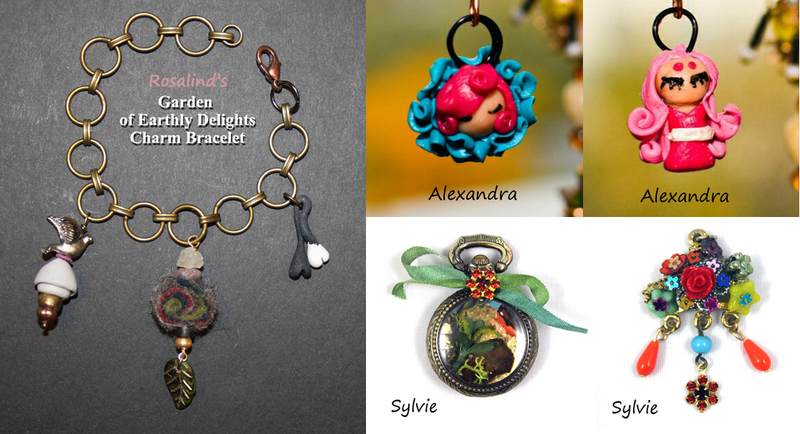 Alexandra explained that she experimented with new tools to work with fimo on her charms for Rosalind’s Garden of Earthly Delights bracelet, adding that she loves using the tiny ballpoints on the tool to make the pieces stick. She was surprised at how the rose head didn’t cause too much trouble — she made the head, stuck on the hair, and added petals around where needed. Our charm bracelets and necklaces are really starting to come together. Don’t they all look great! 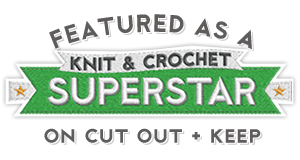 Join me next month to see how I go about crocheting a kokeshi doll for Alexandra’s bracelet. It should be a lot of fun! 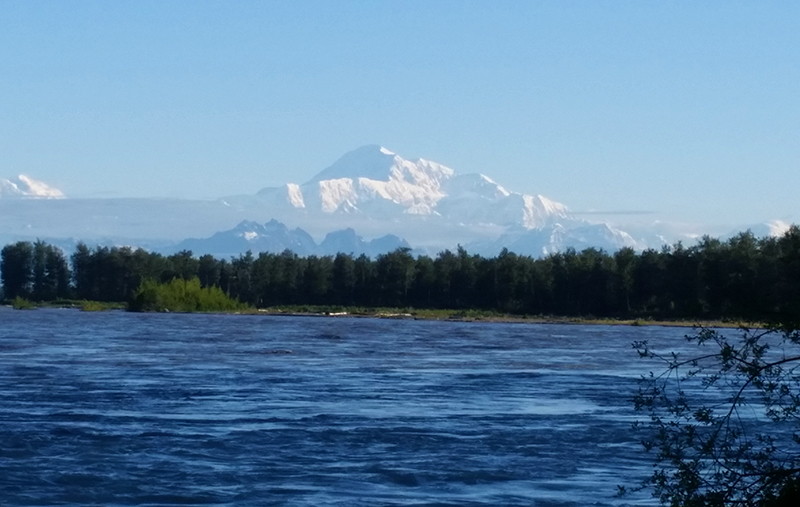 Categories: Friends | Tags: art, beads, bracelet, charms, clay, crafts, crochet, diy, fabric, jewelry, jewelry making, necklace, sculpture | Permalink.